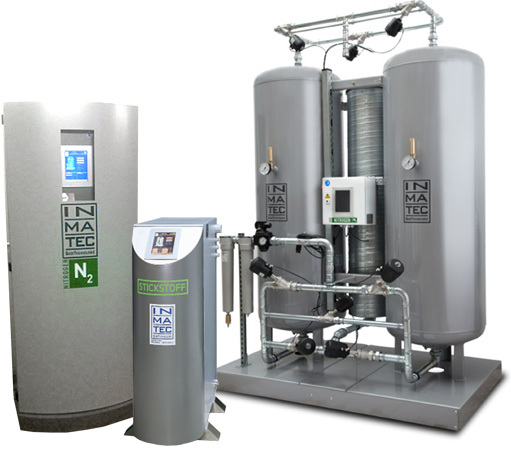 The range of High Flow Nitrogen Generators from IATT offer very high flow rates capable for use in large laboratory applications to industrial scale production facilities. They use either Pressure Swing Adsorption (PSA) or Membrane Nitrogen Generation depending on the nitrogen purity required of up to 99.5% or better than 99.5% up to 99.9999%. What purity of nitrogen is required? Is the compressed air treatment system adequate? Taking all of these parameters into consideration, IATT can select from an array of Nitrogen Generators best suited to your needs. This includes all of the ancillary equipment such as the air compressor, air receiver, pre filters, air dryer, compressed air filtration as well as gas control/mixing and gas analysis.